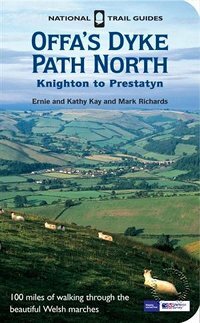 National Trail Guide - Offa's Dyke Path North - Knighton to Prestatyn by Ernie and Kathy Kay and Mark Richards. This route is the best waymarked path that I've seen. However, it would be foolish to try to follow such a path just using the waymarkers. The surest way is to use the waymarkers but to also have a 1:25,000 scale map in your hand. Written description of the route , history and points of interest is a bonus. This book's big strength is that for the cost of one book, you get Ordnance Survey 1:25,000 mapping for the whole of the 97-mile route. For long-distance walkers, it takes you from start to finish in words, pictures and maps. For not-so-long distance walkers, it contains a number of circular walks, again marked on OS 1:25,000 maps. I've walked the route using this book and can vouch for the fact that the book is impressively well-made. A strong waterproof cover and good quality pages are very important with our unpredictable weather. The book fits in the map pocket of your jacket or trousers. I really like the way that the two open corners have been cut to a rounded shape. I wasn't sure why when I bought the book, but it became obvious after a week of being shoved in and out of a damp pocket. Square corners would be a real mess, but these rounded corners stand up to that treatment well. I'm not a fan of 'turn left here' type instructions, but they do occasionally make a useful accompaniment to the mapping and waymarking on the route. Here each page of text is placed opposite the OS map for the area it covers. It also tells you about points of interest and history too. To make planning easier, it contains a distance checklist (key points and distances between) and a little information on accommodation and campsites. (The association sells a proper list for Â£1.50). Watch out for some inconsistency with the layout. When the route is going south-north, the map is on the right-hand page opposite the text and the format works well. However, when the route starts to go east-west, the maps are laid out over two pages inconsistently and that can be confusing at first. I'm a big fan of this range, and this book stands head and shoulders above other guides to this walk.